When you’ve moved three times in your seven year life and have two older brothers who longer play toys, then your collection gets dwindled down to your favorites. P’Diddy is slowly giving away and selling many of the toys that tend to just sit there. 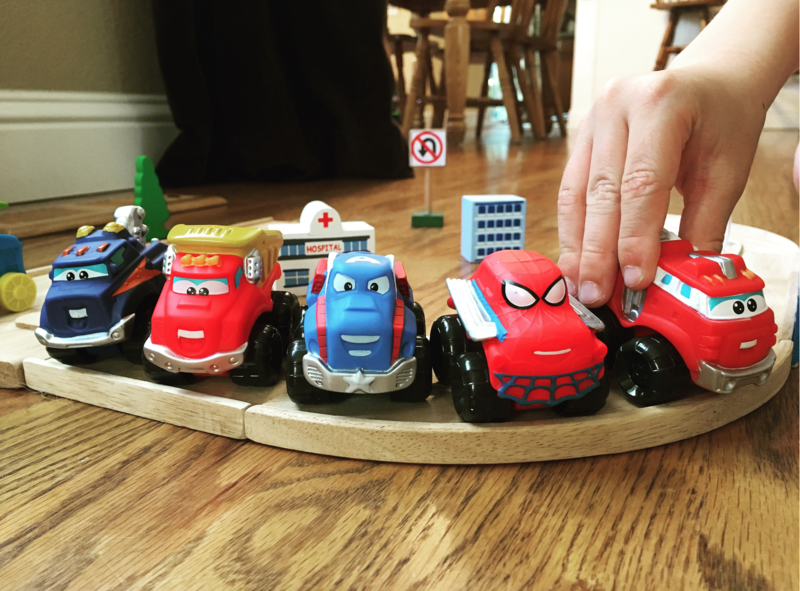 He is down to blocks, superheroes, weapons, army and you know it – vehicles! Jazwares has new mini toy vehicles out for their most popular brands. Peppa Pig. I will admit I don’t know anything about this show, but they are cute! Chuck & Friends. These are his favorite and I’ll find him watching them on tv often. They are soft and squishy which I think makes them more fun. You can collect over 40 vehicles, including Marvel characters! Chuggington Little Chuggers. Each train comes with a garage that can be stacked. Plus they connect to ConnecTrax which are sold separately. Dino Train. How can you not love them? Mini trains that connect together with Buddy in the lead of course! These are perfect size to stick in your bag to bring to the pool, friend’s house, or that appointment where you need a distraction tool. WIN 2 from each set for a total of 8 mini toy vehicles! I partnered with Jazwares who sent me these products for free. All opinions are my own. This giveaway is in no way sponsored, endorsed or administered by, or associated with Jazwares, LLC other than the supplying of the products which are the subject of this giveaway. This giveaway will end on July 5, 2017 at midnight MST. Winners will be drawn via rafflecopter. Once a winner is drawn I will contact them and they will have 48 hours to reply before I draw a new winner. Giveaway is open to anyone in the US. You must be 18 years of age or older. Giveaway is not affiliated with Facebook & I release them of liability. Winner will be posted in the rafflecopter widget. Peppa Pig is my granddaughter's favorite. We had to throw her a Peppa Pig themed birthday party last year. Yes....the Peppa Pig ones are so cute! My kids watch all of those shows but Peppa Pig is their favorite. Yes my grandsons absolutely love watching Peppa Pig and they enjoy Dinosaur Train, too! Our 4 year old grand, Samantha, loves Peppa! 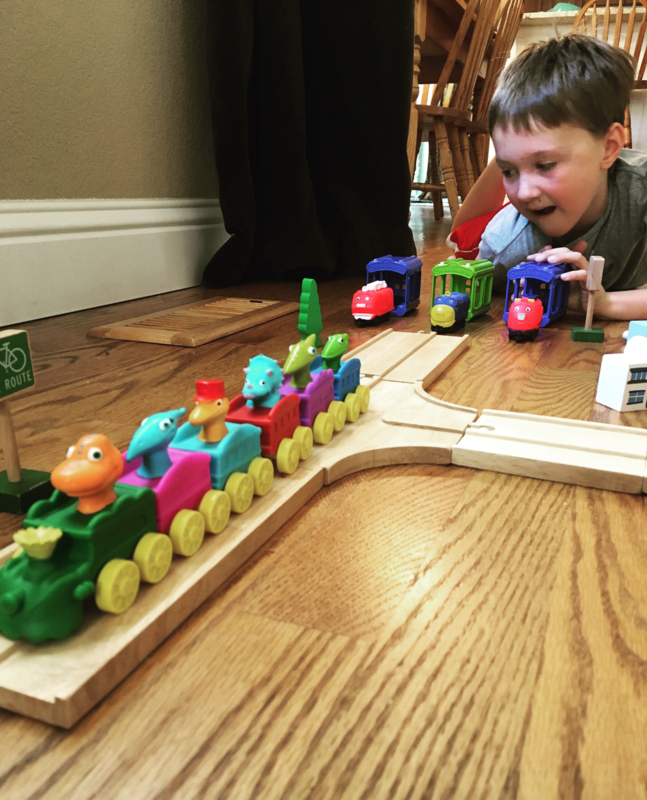 My daughter is a big,big fan of Peppa Pig and my son is crazy about Dino Train! My toddler mostly watches specific youtube nursery rhyme videos but he's OBSESSED with trucks and playing with trucks. He would love these as most of his trucks are very big. My grandchildren love Peppa Pig. My granddaughter loves Peppa Pig and dino Train. My grandson loves the chuck and Chuggington and Dino Train. They would love these. My little nephew loves loves these tv shows they are all so cute love this toy they are so cute. The train show, but all those toys look like a lot of fun. My grandson would loves these. Oh yes Peppa Pig is her all time favorite but she loves them all! My little one loves Peppa Pig. He watches the show everyday. Our little one loves Chuggington, Dino Train and Peppa Pig. My granddaughter absolutely loves Dinosaur Train and Peppa Pig. She would freak out if I won this for her! I have watched WAY too many of these shows with her! haha God bless and good luck everyone! My granddaughter loves Peppa Pig and my grandson loves Chuck & friends. My son loves all these shows! 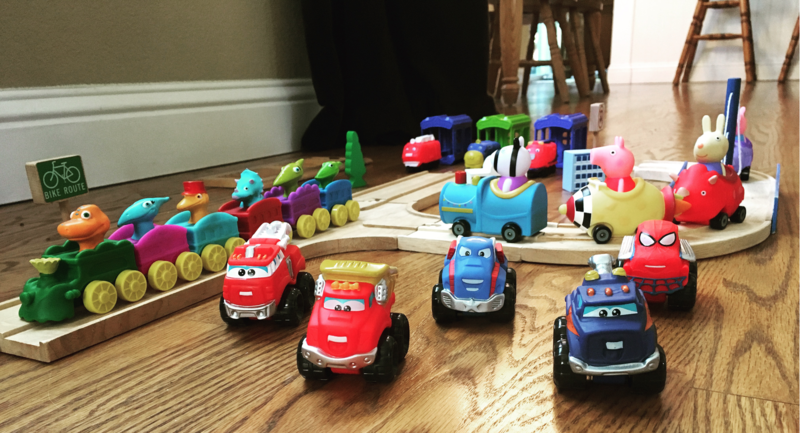 Peppa Pig is a favorite and so is Chuggington! My kids love dinosaur train - just thinking about the show gets the theme song stuck in my head! My daughter loves cars, so these are right up her alley. My niece watches peppy pig but my daughter loves chuggington. My grandson watches all these shows and would love these mini toys! My children are grown but I do know children who love these shows. My nephews like Dino Train and Chuck. My daughter definately loves all the shows , especially Peppa pig ! My son loves chuggington and Peppa Pig! Our kids absolutely love all things Cars. They love the toys they have now and always look for new ones on trips to the toy store. Thanks for the awesome giveaway opportunity. My niece loves Dino Train. My grandson just loves Peppa Pig. That is the only show he wants to watch anymore. My Nephew loves Dino train! Dino Train is a big hit with our kiddos! 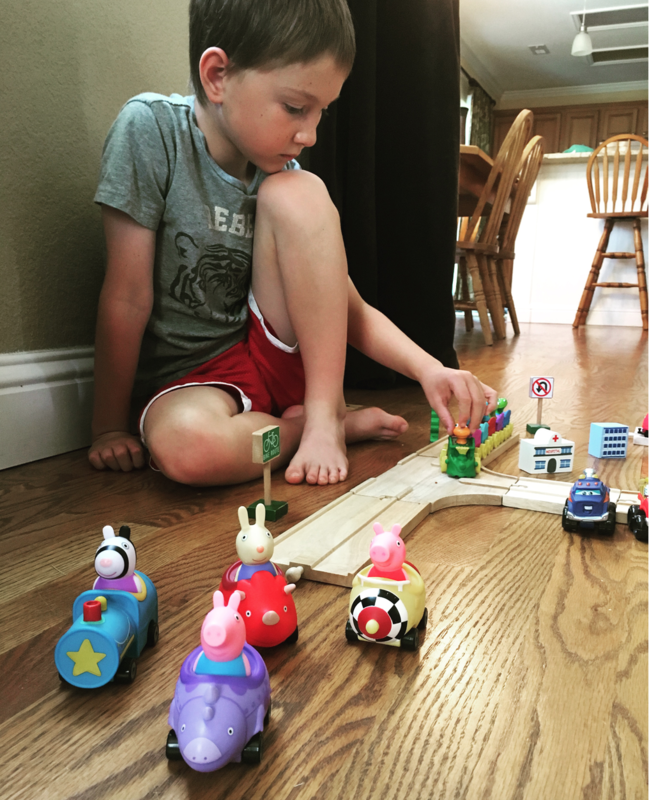 My two sons love Peppa Pig and they have a lot of my money invested in Peppa Pig toys. But it is a cute show. My son loves.....CHUGGINTONNNNNNN (me singing the theme song). My son would love the Chuck Marvel. He also loves Dino train. Chuck Marvel for our household for sure. Some of these character look familiar from my grandson's toy box. He's love these! My grandsons would love to play with these cars. Thank you for the entry. Our grandkids love Peppa Pig, great. My daughter would probably like the Peppa Pig ones and my nephew would like any of the dino ones! Yes, we are huge fans of the Peppa Pig show! They like the Dinosaur Train show. My youngest was super into Peppa Pig and Dinosaur Train! She is a fan of Peppa Pig. My niece would love to play with these! Nope, never seen any of them yet. Mine have not seen any of them. Thank you for the chance to enter the giveaway. My granddaughter loves Peppa Pig! Not sure about the other ones. My son hasn't seen these yet. But he loves cars and trains. Im not sure what my grandsons watch but I do know they like anything with wheels! My granddaughter loves Peppa Pig. I love to hear her giggle everytime she talks about Peppa. My 6 year old likes them all..but his favorite is trains! Thanks for this contest. My daughter has seen Peppa Pig a few times, but she LOVES toy cars! My kids love Peppa Pig! My nephew is into Peppa the pig.